One of NBCnews.com’s top headlines today was “50 Memorable Moments of the Games.” How about that Gabby Douglas? or Michael Phelps? or Usain Bolt (talk about an appropriate name!)? Amazing athletes, all. My favorite Olympic moment—in rowing (no surprise to those who know me)—did not make the list. First, let me say NBC did not show nearly enough rowing, and they made it way too hard to find specific events on their TV schedule (not to mention how far off schedule they got). So when serendipity led me to the Men’s Lightweight 4 final, I rejoiced simply to see some blades in the water. Great Britain was the clear favorite, having dominated the early heats. Denmark and Australia were also contenders—but truly, on any given day, most of the crews had a shot. As with elite runners and swimmers, top rowers frequently finish their race within fractions of a second of each other. The Men’s Lightweight 4 race was no exception, with the top three crews finishing within a third of a second—on a six-minute race. The different race strategies were evident. Do you start fast to gain an early lead? Or row a steady pace, then power it in at the end? Quick lesson: The rower in the stern-most seat is called the “stroke.” The stroke sets the pace; everyone else follows. When the stroke’s oar hits the water, all the oars hit the water. When the stroke speeds up, everyone speeds up. While the whole crew knows the strategy going into the race, everything is dependent on the stroke’s executing the strategy and the rest of the crew’s following. At this elite level of rowing, I expected exemplary technique, stellar athleticism, and a photo finish. What I did not expect was South Africa’s winning its first gold medal in rowing. History has never been my strong suit, so while I knew South Africa had not attended the Olympics for many years, I had to visit Wikipedia for a refresher on dates. South Africa participated from 1904 to 1960, was banned in 1962, then returned in 1992, apartheid having been started in 1950 and dismantled 1990-1994. Now, I keep a pulse on global politics, but I’m by no means an expert on current affairs in South Africa. I imagine that a couple of decades is long enough for significant change, but not nearly long enough for all the old daily injustices to have been completely removed. How much progress has been made? When South Africa won the men’s lightweight 4, James Thompson, Matthew Brittain, and John Smith followed stroke Sizwe Ndlovu to victory. My favorite moment of the Olympics was when three white South Africans followed their black leader—and it got so very little attention. Progress indeed. Well done, crew. I received two very kind awards over the past couple weeks. 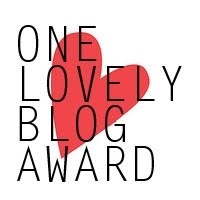 Tom at firsttimerecords nominated me for the One Lovely Blog Award. Thank you for the compliment, Tom! 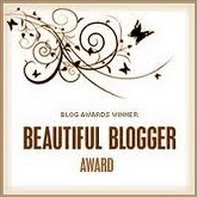 Ms. Nine at Nine Writes nominated me for the Beautiful Blogger Award. Thanks for the Almond Joy, Ms. Nine! Nominate 15 other bloggers for the award and notify them. I am going to combine these two awards and bend the rules a bit—otherwise I wouldn’t get back to my regular writing (which has already been too slow lately). I am a member of the Jane Austen Society of North America (JASNA). I started reading Unfinished Desires: A Novel by Gail Godwin, but couldn’t finish it. Snooze fest. Now I am reading Henning Mankell’s The Troubled Man, a Kurt Wallander novel (you may have seen the adaptations on Masterpiece Mystery—looks like a new set coming up in September!). Mankell tends to focus on social issues and can get a bit dense at times, but I find his work pretty intriguing. I studied Swedish in college (very rusty now), so I get into Scandinavian mystery/thrillers like the Wallander series and Stieg Larsson’s books. I think it’s because I feel cool knowing how to pronounce the names. http://lovernebrown.wordpress.com/ – I want to call out this blog specifically. LoVerne Brown (1912-2000) would be 100 this year. I was not familiar with her poetry until I found this site. I am grateful her work is being shared—it is lovely and thought-provoking.